This month, it's your chance to try Rive Gauche's most popular dessert, GUANAJA PARFAIT! 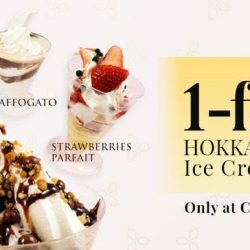 Taste the perfect combination of rich, creamy Hokkaido Milk Ice Cream and French top quality bitter sweet chocolate! Exclusively for JPassport members, You can enjoy 1-FOR-1! Valid from 23rd May - 30th Jun at Citylink outlet. Enjoy 1-for-1 Limited Edition New Tonkotsu Ramen from 20 to 31 May 2017 (selected dates available) at Menya Sakura! All you need to do is to download the Jpassport app and sign up for their member at no charge. Jpassport recommends dining deals from many Japanese restaurants, it's a must for lovers of Japanese food! Redemptions are limited, so hurry! 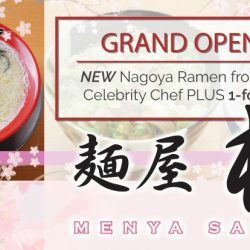 20 - 22 Mar 2017 Menya Sakura: Grand Opening Special 1-for-1 Ramen! Introducing the latest ramen shop MENYA SAKURA by Japanese Celebrity Chef opening at 69 Boat Quay. 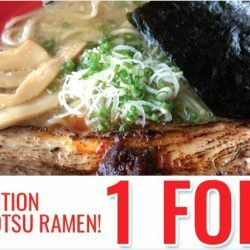 For their Grand Opening on 20-22 March get 1 for 1 SPECIAL RAMEN! All you need to do is to download the Jpassport app and sign up for their member at no charge. Jpassport recommends dining deals from many Japanese restaurants, it's a must for lovers of Japanese food! It’s Sakura season! 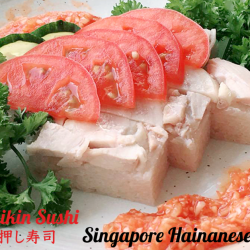 Dun miss these Sakura creations available for a limited time only in Singapore! Sakura season is back this year! The cherry blossom flowers bloom only for a short period of time, between 1 to 2 weeks. If you can't travel to Japan to see them, why not try these Sakura creations available for a limited time only in Singapore? Sakura Cheese Cake, Sakura Strawberry Parfait & Sakura Shiratama Latte! 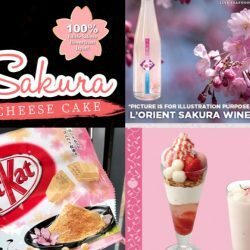 Plus Starbucks Sakura Collection, Sakura wine & even KitKat! Yes all available in Singapore! Check them out now! Ginza Bairin: 90th Anniversary – 50% OFF ALL Set Menus on 9th, 10th, 19th, 20th Feb! Ginza Bairin at Ion Orchard is celebrating it's 90th Anniversary! 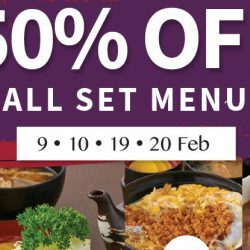 You can enjoy 50% OFF on ALL set menus on 9th, 10th, 19th, 20th Feb! All you need to do is to download the Jpassport app and sign up for their member at no charge. Jpassport recommends dining deals from many Japanese restaurants, it's a must for lovers of Japanese food!